While many have touched our lives and we were sad to see them go there have been just a few that shall always be remembered because they gave us not only their love but their trusted friendship. Sometimes a special animal comes into your life and changes it forever. That is what happened to me when Merlin was born. From the moment he could move around he came to me and thus he stayed. He was always "my dog", "my friend" and became "part of my soul". Merlin accomplished all I ever asked of him, with joy in his heart and a smile on his face. He was my heart dog and not a day goes by that I don't think about him. Cryssy was Kirk's special girl. Not only did she give him success but she was his friend. A little spitfire in blue clothes that achieved much in a very short time. She was funny, stubborn and slightly independent. She was his heart dog. Coal gave us a wonderful ride. He was the happiest dog ever with his main goal in life, playing fetch and making you laugh all the time. He is behind many of our dogs and his wonderful sturcture and temperment can be seen everyday in the dogs that are decended from him. A big thank you to Glenda Josey of Glenesk for letting him come and be such a big part of our family. Coal crossed over to the rainbow bridge at age 16, sweetest dog ever. Spider crossed over to the rainbow bridge at age 12. 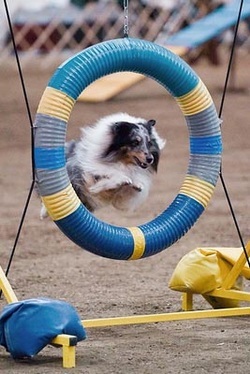 He and Kirk had a fun filled career in the agility ring. Spider always had wonderful willingness to please. It will be strange not seeing him in the ring or playing soccer in the backyard with Kirk. 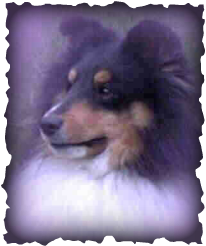 Spider was bred by Ann McMillian of Gratia Shelties.